This is the perfect end to a meal. It’s a light, dessert that won’t leave you over-stuffed. I served this to our neighbors at our annual Memorial Day cookout. It’s quick, easy and delicious. While I used pound cake, an angel food cake would be an even lighter alternative. I purchased a Sara Lee pound cake in the freezer section of my grocery store but you could certainly make one from scratch or use a purchased one from a bakery. I have mini Le Creuset cocotte dishes and they were the perfect serving size but 3″ diameter ramekins would work as well. Be sure to use a top quality jam for the best taste. Fresh orange juice is best but a No Pulp store-bought variety is OK too. The strawberries I purchased were enormous so I sliced them rather than halved them. Use your judgement here. Strawberry Orange Mini Trifles 1/3 cup Bonne Maman strawberry preserves 2 tablespoons orange juice 1 quart strawberries, halved Sugar to taste 2 cups heavy whipping cream 1/4 cup powdered sugar 1 pound cake In a small saucepan, heat strawberry preserves and 2 tablespoons orange juice until melted into a liquid. Place strawberries in a medium bowl. Pour melted preserves over the strawberries and toss well. Check for sweetness and add sugar if necessary. Pour cream into a large bowl. With an electric mixer, whip cream until soft peaks form. Add powdered sugar. Continue to whip until stiff peaks form. Tear or cut pound cake into cubes and place in ramekins filling about 1/2 way. 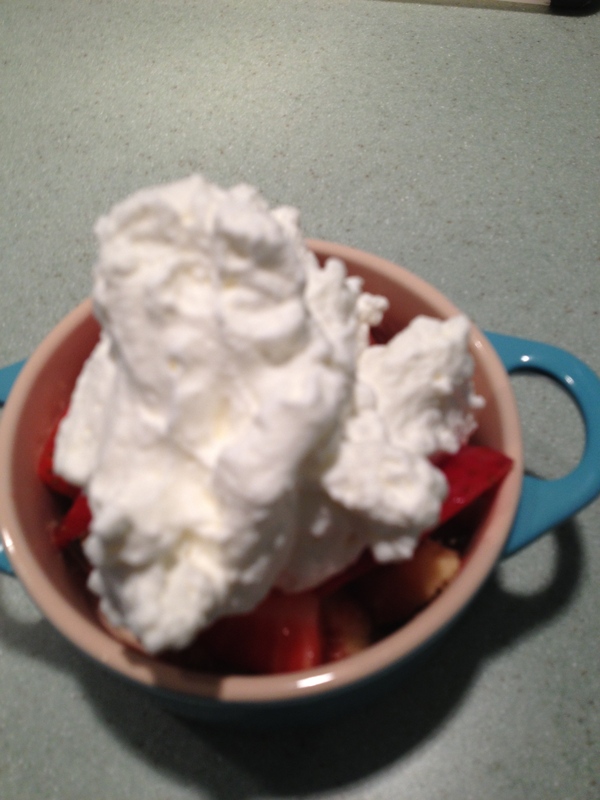 Add a spoonful or two of the strawberry mixture then top with freshly whipped cream. This entry was posted in 4th of July, Company Worthy, Desserts, Entertaining, Holidays and tagged angel food cake, Berry trifle, dessert, fresh whipped cream, orange, pound cake, strawberry, trifle. Bookmark the permalink.